From the U.O. Medical Genetics (T.P., M.S. ), Polyclinic Sant'Orsola-Malpighi, Bologna, Italy; Department of Medical and Surgical Sciences (S.B., F.P., M.S.) and Department of Biomedical and Neuromotor Sciences (L.L., V.M., C.L., C.S., P.T., F.B. ), University of Bologna, Bologna, Italy; IRCCS Istituto delle Scienze Neurologiche di Bologna (L.L., V.M., C.L., C.S., P.T., F.B. ), Bologna, Italy; Laboratory of Integrative Systems Medicine (LISM) (R.D'.A. ), Institute of Informatics and Telematics and Institute of Clinical Physiology, National Research Council, Pisa, Italy; S.C. of Neurology (G.B. ), SS. Annunziata Hospital, Taranto, Italy; Epilepsy Centre (G.d'.O. ), Clinic of Nervous System Diseases, University of Foggia, Riuniti Hospital, Foggia, Italy; Department of Clinical and Experimental Medicine (A.M.), University of Florence, Florence, Italy; and Florey Institute (I.S. ), University of Melbourne, Austin Health and Royal Children's Hospital, Melbourne, Australia. Objective: To identify novel genes implicated in epilepsy with auditory features (EAF) in phenotypically heterogeneous families with unknown molecular basis. Methods: We identified 15 probands with EAF in whom an LGI1 mutation had been excluded. We performed electroclinical phenotyping on all probands and available affected relatives. We used whole-exome sequencing (WES) in 20 individuals with EAF (including all the probands and 5 relatives) to identify single nucleotide variants, small insertions/deletions, and copy number variants. Results: WES revealed likely pathogenic variants in genes that had not been previously associated with EAF: a CNTNAP2 intragenic deletion, 2 truncating mutations of DEPDC5, and a missense SCN1A change. Conclusions: EAF is a clinically and molecularly heterogeneous disease. The association of EAF with CNTNAP2, DEPDC5, and SCN1A mutations widens the phenotypic spectrum related to these genes. CNTNAP2 encodes CASPR2, a member of the voltage-gated potassium channel complex in which LGI1 plays a role. The finding of a CNTNAP2 deletion emphasizes the importance of this complex in EAF and shows biological convergence. EAF also occurs in sporadic cases or in pedigrees with no LGI1 mutation. In these pedigrees, EAF is indistinguishable from LGI1-positive ADEAF. However, the pattern of inheritance may be unclear, there may be phenotypic heterogeneity and EAF may occur in only a minority of cases. Such families do not usually fulfill the criteria for any specific familial epilepsy syndrome. The small size, clinical heterogeneity, and incomplete penetrance displayed by such families with EAF may have hampered gene mapping through traditional approaches, such as linkage analysis. No mutation in genes other than LGI1 has been identified so far in EAF.7,–,10 The advent of next-generation sequencing has made the identification of causal variants possible even in small families. In this study, we describe a comprehensive whole-exome sequencing (WES) approach that enabled us to identify likely pathogenic variants in EAF probands and their affected relatives, demonstrating genetic heterogeneity underlying this epilepsy phenotype. From 2001 to 2014, we recruited consecutive probands with EAF and family history of epilepsy (at least 1 relative within 3 degrees of kinship affected with EAF or other epilepsy). All affected family members underwent phenotyping, including medical and seizure history, neurologic examination, EEG recordings, and brain MRI. Previous medical records were obtained. We received approval from institutional ethical standards committee on human experimentation, and written informed consent was obtained from all patients participating in the study or their parents in the case of minors. Single nucleotide variants (SNVs) and small insertions and deletions (InDels) were called with the Genome Analysis ToolKit,12 and copy number variants (CNVs) were called from WES data using EXCAVATOR.13 Among SNVs and InDels, nonsynonymous SNVs, splice-site substitutions, and coding small insertions/deletions with a population allele frequency <1‰ in public databases (1000 Genomes, http://www.1000genomes.org; Exome Variant Server, http://evs.gs.washington.edu/EVS/; ExAC, http://exac.broadinstitute.org) and absent from approximately 200 patients without epilepsy in our internal exome database were considered further. The priority assigned to variants was higher in those with a lower Residual Variation Intolerance Score (RVIS) percentile (indicating greater intolerance to functional variation)14 and in those predicted to have a likely functional effect by Combined Annotation-Dependent Depletion (CADD) score15 (higher CADD scores indicate that the variant is more likely to be functionally relevant), or predicted to alter splicing or to be protein-truncating (frame-shift InDels or nonsense SNVs). Among CNVs, a higher priority was assigned to events that were not observed to occur in regions known to be involved in segmental duplications or were rare (allele frequency <1‰) in the Database of Genomic Variants (http://dgv.tcag.ca/dgv/app/home) by manual inspection. When WES of 2 affected members of the family (table 1) had been performed, only the variants shared by the 2 were retained. Validation and segregation analysis of candidate variants and CNVs were performed using Sanger sequencing and quantitative PCR analyses, respectively, following standard protocols. We included 12 consecutive probands of Italian ancestry attending the Epilepsy Center of our Institute in Bologna. Three additional cases were referred by 2 other epilepsy centers in Italy. A mutation or CNV of LGI116 was excluded in all 15 probands with EAF. Pedigree analysis revealed a total of 34 affected relatives: 6 with EAF (in the 5 families A, D, G, H, and I in table 1) and 28 with other epilepsy (table 1). Two families have been previously reported,6,17 while the remaining 13 pedigrees are described here for the first time. To analyze WES data, we initially focused on a set of 344 genes (table e-1 at Neurology.org/ng) implicated in monogenic disorders including epilepsy as a phenotypic feature based on previously published work18 and the OMIM database (www.omim.org). We identified 7 candidate variants of 5 genes, each in one of 7 families. These variants were validated in every individual who underwent exome testing. We then tested segregation in all the available family members, both unaffected and affected by EAF or other epilepsies, who had no WES performed. After testing segregation, 6 variants remained: 1 CNV in CNTNAP2 (contactin-associated protein-like 2; OMIM *604569), 1 SNV and 1 InDel in DEPDC5 (DEP domain-containing protein 5; OMIM *614191), 1 SNV in SCN1A (sodium channel, voltage-gated, type 1, alpha subunit; OMIM *182389), 1 SNV in CACNA1H (calcium channel, voltage-dependent, T type, alpha-1H subunit; OMIM *607904), and 1 SNV in RELN (REELIN, OMIM *600514). An intragenic deletion of CNTNAP2 (p.Gln33Argfs*7) was identified in both the affected members of family A (figure 1). The proband (A:IV:1), aged 47 years, presented at 9 years with episodes characterized by confusion, distortion of voices, and inability to speak, occasionally followed by a bilateral tonic-clonic seizure. From 37 years of age, she had an aura of the noise of a train followed by an aphasic phase and sometimes twitching of her mouth and left arm, drooling, and head deviation to the right. Interictal EEG showed left temporal theta activity, and brain MRI was unremarkable. Her father (A:III:1) experienced seizures with auditory phenomena and rare bilateral tonic-clonic seizures from 15 to 18 years. The CNV of CNTNAP2 identified spans about 270 kb across exons 2-3 and is predicted to produce an out-of-frame transcript p.Gln33Argfs*7 (NM_014141:c.98_402del) and to result in loss of function. Pedigrees of the mutated families with mutations and schematic representation of the genes and the identified variants are presented. Phenotype labels: EAF = epilepsy with auditory features; GTCS = generalized tonic-clonic seizures; GS = generalized seizures; FS = febrile seizures; unclassified: it is undetermined whether the seizure type is focal or generalized. Gene diagrams and variants: blue lines represent the genomic regions spanned by the gene, while the blue bars represent the exons. Colored blocks surrounding gene regions correspond to the protein domains encoded by the embedded exons. DEP = Dishevelled, Egl-10 and Pleckstrin domain; D1-4 = domains 1–4; F5/8 = discoidin domain; LGL = laminin G-like domain; EL = EGF-like domain; FCT = fibrinogen C-terminal domain; TM = transmembrane domain. The probands' Sanger sequencing electropherogram surrounding the variant site is reported. The histogram plot represents the result of the real-time PCR. Log2ratios of ΔΔCt from patient A:III:1, patient A:IV:1, and a normal individual each against a control sample are plotted. The control sample is one that was negative for CNTNAP2 rearrangements by array comparative genomic hybridization analyses. Four probes were tested. Probe 1 and probe 2 are located in intron 1, while probe 3 and probe 4 are located in intron 3. Two different truncating mutations of DEPDC5 were found in 2 probands. Both DEPDC5 variants were predicted to be loss-of-function alleles. A single base out-of-frame deletion p.Leu1371Argfs*14 (NM_001136029:c.4112delT) was detected in 3 affected members of family B (figure 1). The proband (B:III:1) with EAF had onset at 12 years of episodes comprising “a sensation of a whistle in the right ear,” sometimes associated with a rising epigastric sensation and followed by impairment of awareness and gestural automatisms. Interictal EEG showed bitemporal theta activity. The other 2 affected members have other types of focal epilepsy. Her mother (B:II:1) developed focal seizures at 9 years characterized by a rising epigastric sensation and autonomic phenomena followed by impaired awareness and head deviation. Her maternal aunt (B:II:2) experienced focal seizures from 9 years that began with a nonspecific aura and sometimes evolved to a bilateral tonic-clonic seizure. Her EEG showed right temporal sharp wave complexes. In family C (figure 1), we identified a stop-gain substitution p.Tyr306*(NM_001136029:c.C918G). The proband (C:IV:1) had a single febrile seizure (FS) at 6 months of age and then had rare right tonic seizures, occasionally followed by a bilateral tonic-clonic seizure, predominantly during sleep until 2 years of age. Since childhood, she has also had seizures preceded by auditory phenomena and/or déjà vécu, sometimes followed by impaired consciousness. By 29 years, seizures occurred weekly, despite trials of several antiepileptic drugs. Interictal EEG showed bitemporal theta activity. Her mother (C:III:2) had FSs at 2 years and focal seizures beginning with visual phenomena, déjà vu, and an epigastric aura between 12 and 35 years. Brain MRI was normal in all patients from both families. A missense change p.Arg1669Gln (NM_001005407:c.G5006A) of CACNA1H was identified in the 38-year-old proband of family E (table 1). The CACNA1H SNV identified was inherited by her mother (E:I:1), who experienced sleep-related bilateral tonic-clonic seizures at 36 years of age. Rare amino acid substitutions altering function of the channel encoded by CACNA1H have been reported in families with predominantly generalized epilepsies, as well as temporal lobe epilepsy.20 The present change was potentially deleterious (table e-2). Functional assessment of the pathogenic potential was not performed as part of this study but is needed to confirm a causal role. A missense change p.Asp3323Glu (NM_005045:c.T9969G) of RELN was identified in the 52-year-old proband of family F (table 1). Segregation of the variant could not be tested since no relative was available for this study. The father's grandfather, who was the only other affected member of the family (table 1), was already deceased at the time of enrollment. RELN encodes reelin, which is essential for cerebral cortex development and synaptic function in the adult brain.21 Homozygous recessive loss-of-function RELN alleles have been shown to cause lissencephaly22 (OMIM #257320), while heterozygous variants have been purported to play a role in neuropsychiatric disorders.21 Reelin is a huge protein (3460 aa, Uniprot ID P78509). Although RELN is highly intolerant to functional variation and the present variant is potentially deleterious (table e-2), many rare missense variants accumulate in RELN (ExAC database). Due to the lack of segregation testing and uncertainty of its functional effect, we cannot assess a causal role of this heterozygous variant. We further analyzed WES data looking at variants in genes beyond the initial set. In order to identify possible candidates for EAF, we examined variants within genes shared by at least 2 unrelated probands. We validated and tested the segregation of variants in 4 genes, selected based on the lowest RVIS scores and the highest pathogenic potential. After testing the segregation, only the echinoderm microtubule associated protein-like 6 gene (EML6) remained as a possible candidate gene. EML6 showed a novel p.Ala186fs frameshift event (c.558delA) in family M and a rare p.Thr918Ala missense variant (c.A2752G) in family F (table e-2). The function of EML6 is largely unknown, and apart from its reported expression in cerebral temporal cortex (http://www.braineac.org/), no data support its possible dysfunction being implicated in epilepsy. Moreover, a major role in disease for any of the variants in EML6 and RELN, which have both been found in family F, is difficult to ascertain. Study of larger cohorts will be needed to assess whether this gene can contribute to EAF. The discovery of DEPDC5 mutations in 2 of 15 probands is in line with the frequency of DEPDC5 mutations observed in other focal epilepsies (around 10%).23,27 The 2 identified DEPDC5 mutations (c.C918G and c.4112delT) are loss-of-function events, both predicted to generate a prematurely truncated product. These mutated transcripts likely undergo nonsense-mediated decay leading to haploinsufficiency, which is the main mechanism believed to underlie pathogenesis.23,28 These results enlarge the DEPDC5-related phenotypic spectrum to include EAF with lateral temporal lobe semiology, further strengthening the emerging association of defects in this gene with a broad range of focal epilepsies. It could be anticipated that different epilepsy phenotypes, including EAF, will be associated with DEPDC5 mutations in other small families. Similarly, the discovery of an SCN1A c.T2867C change in family D widens the already large compendium of epilepsy phenotypes associated with SCN1A mutations. In this interesting pedigree, the EAF phenotype is limited to the proband and her daughter, but expanding the clinical and genetic study of this family allowed us to define the diagnosis of the familial epilepsy syndrome of generalized epilepsy with febrile seizures plus (GEFS+). SCN1A has been implicated in different epilepsy syndromes ranging from GEFS+29 to Dravet syndrome (OMIM #607208)30 and occasionally includes focal seizures.24,25 Lateral temporal semiology with auditory symptoms due to SCN1A mutation has not been previously reported, and our findings indicate EAF as a novel phenotype within the SCN1A phenotypic spectrum. (A) Schematic indicating the functional relationship linking LGI1 and CASPR2 proteins through the voltage-gated potassium channel (VGKC). (B) Schematic indicating the previously reported microdeletions (horizontal bars) of CNTNAP2 in neuropsychiatric conditions (modified from Rodenas-Cuadrado, 2013). The deletion reported in this study, spanning CNTNAP2 exons 2-3, overlaps most of the CNTNAP2 deletions implicated in disorder before. It is represented in red with a halo surrounding it. ADHD = attention-deficit/hyperactivity disorder; ASD = autism spectrum disorder. Additional variants were identified in different genes, either previously implicated in epilepsy (CACNA1H, RELN) or not (EML6), but their actual contribution to EAF cannot be assessed based on our present observations. Overall, defects in 3 novel genes were associated with EAF. Of the pedigrees in which these mutations were found, 1 with a CNTNAP2 deletion may have ADEAF, as both affected individuals have the EAF phenotype and the genetic inheritance model is autosomal dominant. The association of ADEAF with a CNTNAP2 deletion shows biological convergence and opens new perspectives on the contribution of non-LGI1 VGKC-complex proteins to the EAF phenotype. 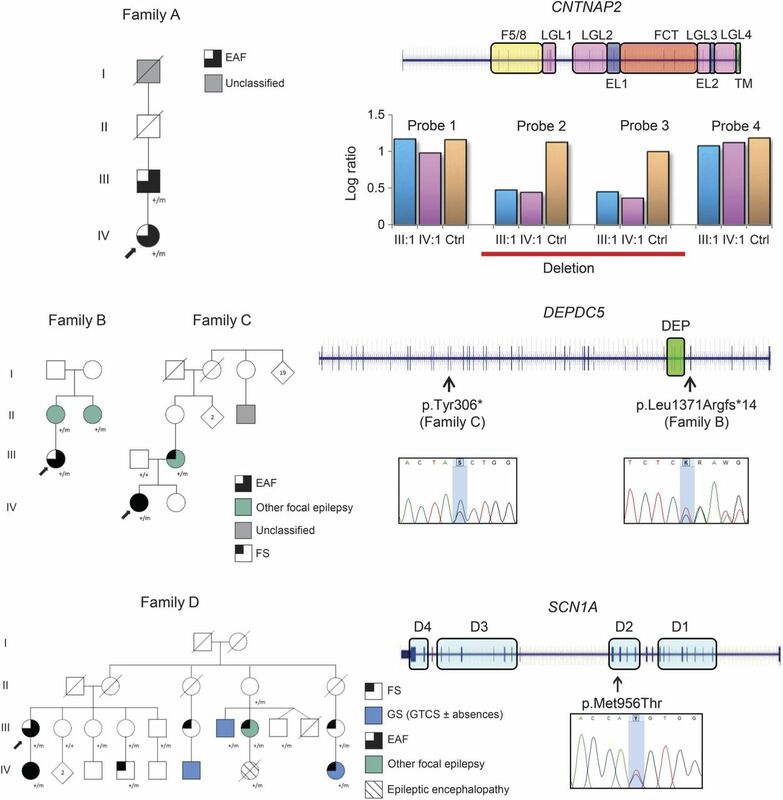 The identification of mutations in DEPDC5 and SCN1A in families showing heterogeneous phenotypic patterns enlarges the phenotypic spectrum of the epilepsies associated with these genes. Overall, our results suggest that EAF is an epilepsy phenotype originating from alterations in a heterogeneous group of genes implicated in a broader range of epileptic syndromes or neurologic diseases. This overlap, frequently observed in other forms of epilepsy (e.g., autosomal dominant nocturnal frontal lobe epilepsy),27,28 reflects the complexity of the involved molecular mechanisms and reveals the challenge of incorporating the underlying biology into the current classification of epilepsies. This study emphasizes the use of a comprehensive WES strategy, tackling both mutations and CNVs, in an effort to solve challenging diagnostic puzzles in epilepsy. Dr. Pippucci, Dr. Licchetta, S. Baldassari, and Dr. Bisulli conceptualized and designed the study and drafted the manuscript. Dr. Menghi, Dr. Leta, Dr. Stipa, Dr. Boero, Dr. d'Orsi, and Dr. Bisulli phenotyped the patients. Dr. Pippucci, Dr. Licchetta, S. Baldassari, F. Palombo, Dr. D'Aurizio, Dr. Magi, and Dr. Bisulli collected, analyzed, and interpreted the data. Dr. Scheffer, Dr. Seri, and Dr. Tinuper critically revised the manuscript for important intellectual content. Italian Ministry of Health Young Investigators project GR-2009-1574072 to T.P. and F.B., Telethon Foundation Project GGP13200 to P.T. and T.P. Dr. Pippucci has worked for Azienda Ospedaliero-Universitaria Careggi and has received research support from the Italian Ministry of Health and Telethon Foundation. Dr. Licchetta reports no disclosures. S. Baldassari has received research support from the Italian Ministry of Health and Telethon Foundation. F. Palombo has received research support from the Italian Ministry of Health and Telethon Foundation. Dr. Menghi, Dr. D'Aurizio, Dr. Leta, Dr. Stipa, Dr. Boero, Dr. d'Orsi, and Dr. Magi report no disclosures. Dr. Scheffer has received funding for travel and/or speaker honoraria from Sanofi, UCB, and Transgenomics; has served on editorial boards for Neurology, Epilepsy Currents, Annals of Neurology, Epileptic Disorders, Progress in Epileptic Disorders series, and Virtual Neuro Centre; holds patents for methods of treatment and diagnosis of epilepsy by detecting mutations in the SCN1A gene, A Diagnostic Method for Epilepsy (also published as Methods for the Diagnosis and Treatment of Epilepsy), Mutations in Ion Channels, Diagnostic and Treatment Methods Relating to Autosomal Dominant Nocturnal Frontal Lobe Epilepsy and pending patents for gene and mutations thereof associated with seizure disorders, gene and mutations thereof associated with seizure and movement disorders, and diagnostic and therapeutic methods for EFMR; and has received research support from NHMRC, NIH, The University of Melbourne, Austin Health Medical Research Foundation, Melbourne Neurosciences Institute, Weizmann Institute, CURE SUDEP, and Perpetual Philanthropic Services. Dr. Seri reports no disclosures. Dr. Tinuper has served on scientific advisory boards of UCB Pharma and Cyberonics; has received funding for travel and/or speaker honoraria from Cyberonics; and has served on the editorial board of Seizures. Dr. Bisulli has received research support from the Italian Ministry of Health Young Investigators and Telethon. Go to Neurology.org/ng for full disclosure forms. The authors are grateful to the families for participation in the study, especially to the probands for their valuable assistance during in loco assessment of the family. The authors acknowledge Mrs. Annalia Cesare for secretarial help in keeping in contact with patients, Ms. Elena Zoni for help in manuscript editing, and Dr. Lara Alvisi and the other EEG technicians at our institute for recording the patients. The authors acknowledge the genetic commission of the Italian League Against Epilepsy for discussion of the pedigrees and valuable suggestions for the study design. Accepted in final form April 2, 2015.
. Localization of a gene for partial epilepsy to chromosome 10q. Nat Genet 1995;10:56–60.
. Mutations in the LGI1/Epitempin gene on 10q24 cause autosomal dominant lateral temporal epilepsy. Hum Mol Genet 2002;11:1119–1128.
. Mutations in LGI1 cause autosomal-dominant partial epilepsy with auditory features. Nat Genet 2002;30:335–341.
. LGI1 mutations in autosomal dominant partial epilepsy with auditory features. Neurology 2004;62:1120–1126.
. Low penetrance of autosomal dominant lateral temporal epilepsy in Italian families without LGI1 mutations. Epilepsia 2013;54:1288–1297.
. Autosomal dominant partial epilepsy with auditory features: a new locus on chromosome 19q13.11-q13.31. Epilepsia 2014;55:841–848.
. Absence of mutations in the LGI1 receptor ADAM22 gene in autosomal dominant lateral temporal epilepsy. 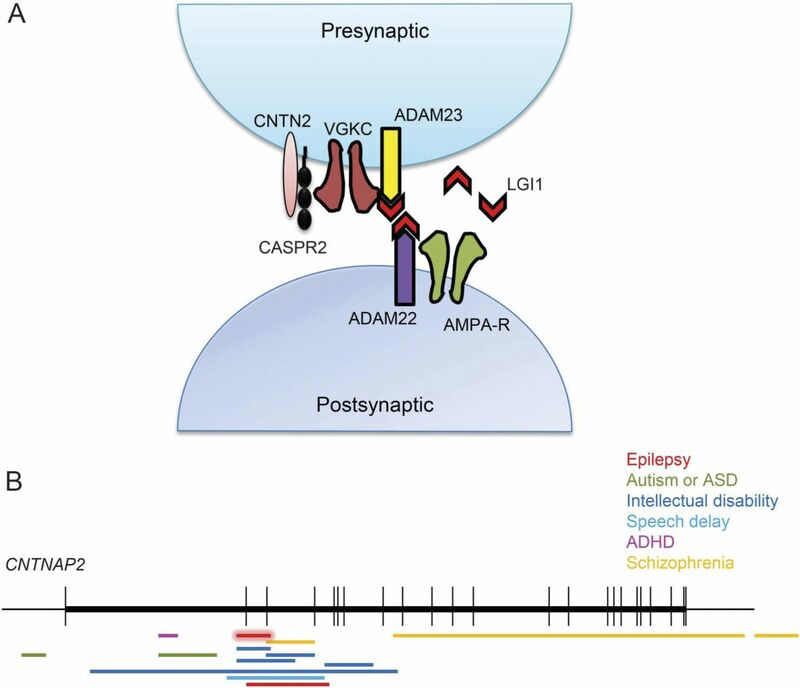 Epilepsy Res 2007;76:41–48.
. Autosomal dominant lateral temporal epilepsy: absence of mutations in ADAM22 and Kv1 channel genes encoding LGI1-associated proteins. Epilepsy Res 2008;80:1–8.
. ADAM23, a gene related to LGI1, is not linked to autosomal dominant lateral temporal epilepsy. Epilepsy Res Treat 2011;2011:258365.
. A mutation in PAK3 with a dual molecular effect deregulates the RAS/MAPK pathway and drives an X-linked syndromic phenotype. Hum Mol Genet 2014;23:3607–3617.
. EXCAVATOR: detecting copy number variants from whole-exome sequencing data. Genome Biol 2013;14:R120.
. LGI1 microdeletions are not a frequent cause of partial epilepsy with auditory features (PEAF). Epilepsy Res 2014;108:972–977.
. Idiopathic partial epilepsy with auditory features (IPEAF): a clinical and genetic study of 53 sporadic cases. Brain 2004;127:1343–1352.
. Targeted next generation sequencing as a diagnostic tool in epileptic disorders. Epilepsia 2012;53:1387–1398.
. Rescuable folding defective Na(V)1.1 (SCN1A) mutants in epilepsy: properties, occurrence, and novel rescuing strategy with peptides targeted to the endoplasmic reticulum. Neurobiol Dis 2015;6:100–114.
. Extended spectrum of idiopathic generalized epilepsies associated with CACNA1H functional variants. Ann Neurol 2007;62:560–568.
. The involvement of Reelin in neurodevelopmental disorders. Neuropharmacology 2013;68:122–135.
. Autosomal recessive lissencephaly with cerebellar hypoplasia is associated with human RELN mutations. Nat Genet 2000;26:93–96.
. Partial and generalized epilepsy with febrile seizures plus and a novel SCN1A mutation. Neurology 2001;57:2265–2272.
. Electroclinical features of a family with simple febrile seizures and temporal lobe epilepsy associated with SCN1A loss-of-function mutation. Epilepsia 2007;48:1691–1696.
. DEPDC5 mutations in families presenting as autosomal dominant nocturnal frontal lobe epilepsy. Neurology 2014;82:2101–2106.
. Mutations of SCN1A, encoding neuronal sodium channel, in two families with GEFS+2. Nat Genet 2000;24:343–345.
. De novo mutations in the sodium-channel gene SCN1A cause severe myoclonic epilepsy of infancy. Am J Hum Genet 2001;68:1327–1332.
. Expanding the clinical spectrum associated with defects in CNTNAP2 and NRXN1. BMC Med Genet 2011;12:106.
. CNTNAP2 gene dosage variation is associated with schizophrenia and epilepsy. Mol Psychiatry 2008;13:261–266.
. Recessive symptomatic focal epilepsy and mutant contactin-associated protein-like 2. N Engl J Med 2006;354:1370–1377.
. CNTNAP2 and NRXN1 are mutated in autosomal-recessive Pitt-Hopkins-like mental retardation and determine the level of a common synaptic protein in Drosophila. Am J Hum Genet 2009;85:655–666.
. Interaction proteomics of canonical Caspr2 (CNTNAP2) reveals the presence of two Caspr2 isoforms with overlapping interactomes. Biochim Biophys Acta Epub 2015 Feb 21.
. The epilepsy-linked Lgi1 protein assembles into presynaptic Kv1 channels and inhibits inactivation by Kvbeta1. Neuron 2006;49:697–706.